Four friends, three nights, two and a half days, and one fantastic theater production! With more fun than time, Three Friends and a Fork set off to see the Carole King inspired musical, Beautiful, in New Orleans. I left home, stopped in Birmingham to pick up our friends, Merri and Julie, and then headed to Tuscaloosa to collect Luanne, before setting our sights on Meridian, Mississippi, where we planned to spend our first night. We made it to Meridian in time to eat dinner at our favorite Meridian restaurant, Weidmann's (pronounced Widemann's). You know you've arrived at Weidmann's when you see the pretty carousel horse on the sidewalk outside. Weidmann's has been in operation since 1870. That year, Ulysses S. Grant was president and Robert E. Lee died. Construction on the Brooklyn Bridge began and Felix Weidmann opened a tiny restaurant in Meridian, Mississippi, with just a counter and four stools. In the 1940's there was a butter shortage. Crocks of peanut butter were placed on each table in place of the butter. The tradition stuck and to this day, Weidmann's brings a crock of peanut butter to each table to start the meal. You can even buy a Weidmann's crock, if you so choose. Today, Weidmann's is a fine dining restaurant that has entertained a number of celebrities and many of their pictures adorn the walls. One of the latest, was VP Mike Pence, who visited during the recent presidential race. We were tired and not feeling especially important by the time we arrived at Weidmann's, but the staff made us feel special anyway. We were quickly seated, menus handed out, drink orders taken and our peanut butter crock placed on our table. As we munched on peanut butter and crackers, we decided on our entrees. Julie and I chose to split an order of shrimp remoulade salad, along with a cup of the soup of the day, which was a brothy chicken mushroom soup with artichokes. Our meals arrived with a basket of perfect homemade bread and real butter. Merri and Luanne split an order of shrimp and grits which they both loved. Then we all shared a pecan praline bread pudding with ice cream and praline sauce. It was delicious. We left Weidmann's and headed to our motel to recharge so that we could get an early start the next morning. New Orleans was waiting and we didn't want to be late. Friday morning, we ate a quick breakfast at the motel and jumped back in the car for the three hour drive into New Orleans. On the way, we discussed, what else, lunch! Luanne told us that her dentist, who is from New Orleans, told her if we wanted to get the best and freshest seafood, to eat at one of the restaurants on the banks of Lake Pontchartrain, where the boats bring in seafood right after it is caught. With that in mind, I began googling. I came up with a restaurant named The Blue Crab. It had good reviews and the name sounded like a good omen, since it was also National Crab Day. I will also tell you, that getting to the Blue Crab was not a straight shot and Lu, Merri and Julie were getting mighty skeptical before we reached our destination. I'm pretty sure they were thinking I had made a bad decision. However, we finally found The Blue Crab sitting right on the water. We secured a parking place and climbed a long row of stairs to the wide, light filled dining room. With each step, I prayed I had made a good choice, because I was pretty sure I would hear about it if I didn't. We were seated right away, ordered our drinks and began studying the menu. Luanne and I quickly decided we would share an order of chargrilled oysters. Merri ordered barbecued shrimp and Julie opted for barbecued shrimp and grits. We also decided to share an order of brown sugar corn muffins and, since it was National Crab Day and we were at The Blue Crab, after all, an order of crab dip. I'm not going to say we overdid it, but, well, yeah, we did. Luanne and I practically swooned over the chargrilled oysters. Lu said she thought they were the best things she had ever tasted in her life and I was pretty much agreeing. They were smoky, buttery, lemony, herby and parmesan cheesy, in a word, divine. It was all we could do to keep from putting the shells in our mouths. Not to be outdone, Merri and Julie were giving similar accolades to their barbecued shrimp. They weren't kidding either. You could drink that sauce with a straw! Julie's came with grits, which were creamy and delicious. We were all so happy with our choices, especially me, because I didn't want to be a bad restaurant chooser. Beyond our main entrees, the brown sugar corn muffins were wonderful, almost like dessert. The hot crab dip was full of fresh crab, creamy and very tasty. Our trip was off to a great start. We left The Blue Crab and headed toward the French Quarter to check into our hotel and start exploring. There was so much to do with so little time and we didn't want to waste a minute. After checking in to our room at the Hilton, we put on our walking shoes. 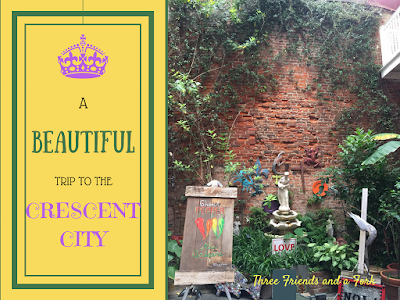 We walked up and down the narrow streets of the old, historic part of the city, stopping to take pictures of pretty buildings, doorways and windows and taking time to duck into quaint shops full of art, antiques and gifts. Julie, our resident artist was especially thrilled with all the art lining the fences surrounding Jackson Square. Actually, everywhere you look in New Orleans gets your artistic juices flowing. The city is so inspirational! From the beautiful St. Louis Cathedral in the heart of Jackson Square to the music and entertainment around every corner, New Orleans is exhilarating. 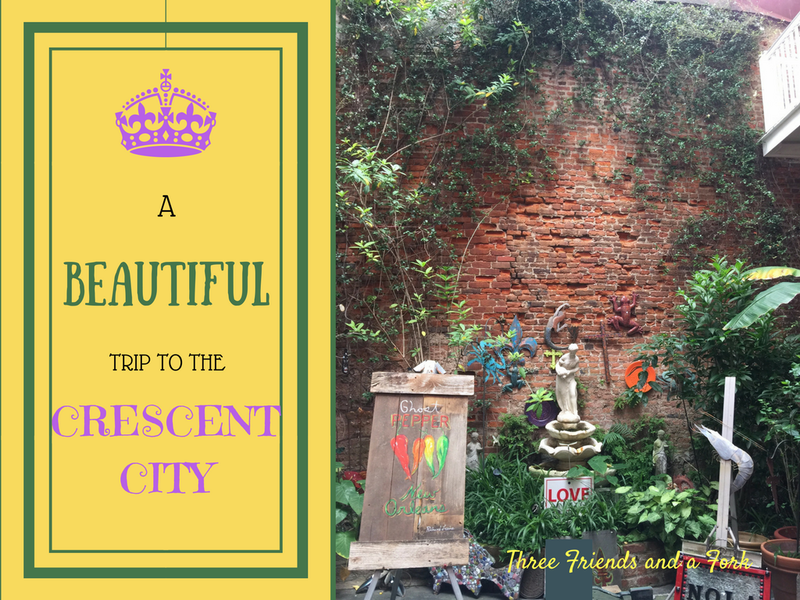 Even though this wasn't the first trip to the city for any of us, each visit is an original, and there is always something new to see or something old to see in a new way. We decided to be totally touristy and take a carriage ride around the square and our driver was quite entertaining. Along with his pointy canines (he also does a vampire tour at night), he pointed out lots of interesting things along the way and gave us some historical background. The pretty horse posed for me! This cheese shop was amazing! After our ride around the Quarter, we resumed walking and I will tell you, while I didn't break my all time record for steps taken in New Orleans (that record of 24,957 steps was set when I visited with Haley and Ayla last year), we did manage some championship walking. My phone was groaning from counting steps and finally let me know it was exhausted from the 13,642 steps we took that day. All that walking and ooohing and ahhhing and picture taking and shopping took its toll and we realized our Blue Crab lunch was long gone and it was dinner time! This time we had reservaions at a porker of a place, Cochon Haley and Ayla and I had tried to dine at Cochon last year, but we could not secure reservations, so I planned ahead for this visit. Cochon's, as the name implies, is all about the pig, though the menu is eclectic with selections such as, oyster, shrimp, alligator, fish, crab, rabbit and beef brisket. We weren't feeling especially adventurous with our drinks, so we talked our waiter into some lemon drop martinis rimmed with sugar, which were not on the menu, but should be, because they were delicious. Then we got down to business. Since the pig is king at Cochon, we decided that we should honor him by going pork all the way. We got two orders of smoked pork ribs with watermelon pickle (if you know anything about me, you know the watermelon pickle was the deal maker!) and split them, so that we each got two ribs apiece. Trust me when I tell you this was plenty! We also shared some horseradish potato salad (everyone but the no mayo queen, Luanne). Then, to top off this wonderful meal, we shared a bowl of coconut lime sherbet with a crispy sugar cookie pig for crunch. Wow! It was all so good! After dinner, we took a walk down Bourbon Street for some musical entertainment and a visit to a cool bar Luanne had visited before, called Tiki Tolteca, which had a definite South Pacific vibe. We checked out several music venues. One of our favorites was a band called, Chicken on the Bone. They played classic rock numbers we all knew. Finally, we hobbled back to the Hilton to rest up for our last full day in the Crescent City, which promised to be even more exciting, because we would be ending it with the reason for the trip, the Carole King inspired play, Beautiful, at the equally beautiful, Saenger Theater. Saturday morning, we planned on stopping by Cafe DuMonde for beignets, but the line was longer than we had patience for, so we slid into a restaurant right across the street called, Monty's on the Square, which promised beignet fries. We thought those might be a good consolation prize for not standing in line for the real thing. We were right. We all enjoyed those beignet fries and they were covered in powered sugar for the authentic experience. Then we shared some fried artichokes which were also delicious. Julie sampled the gumbo, which she really liked. We spent some time strolling through the French Market, where a few beautiful photographs of New Orleans might have been purchased. This beautiful golden statue of the Maid of Orleans, Joan of Ark, stands near the Market. The statue was given to the city from France in 1972. The gilded statue is surrounded by the flags of the United States, New Orleans, Louisiana and France. We spent more time shopping, looking at art and, in general, enjoying all the sights and sounds of the city, before it was time to head back to the hotel to get ready for our big night. Our pre-theater dinner reservations were made at a restaurant with which Merri was familiar, Mr. B's Bistro, and thankfully, it was conveniently located near our hotel. We started with pear cosmos made with pear vodka, triple sec, cranberry juice and lime. They were light and wonderful. Then came this delicious bread, delivered in its own bag, accompanied by fresh butter. It was so good! For dinner, Luanne chose grilled mahimahi with wild rice and fresh asparagus. I really wanted the beef tenderloin burger on a homemade bun and served with truffle fries, but when our server explained it would take 25 minutes to prepare, I joined Merri and Julie and ordered the truffle buttered filet mignon with garlic butter potatoes and sautéed spinach. It was a great choice, but I am definitely going back to check out that burger! Since we had a show to go to, I didn't want to take a chance on running late. We finished up our meal with a couple of yummy desserts. I'm not a fan of pecan pie usually, because of the jelly like center, but Mr. B's hot buttered pecan pie sounded interesting, so we got one of those, along with a white chocolate brownie. Both were topped with vanilla ice cream and both were delicious. By the time we finished our desserts and paid our bill, it was time for my three beautiful friends and I to head over to the beautiful Saenger to see Beautiful. We were so excited! Our first glimpse of the Saenger, lit up the night sky. And the entrance hall did not disappoint, either. But the inside of the theater itself was like a dream. You had the feeling you were sitting outside under the night sky, surrounded by ancient ruins. Absolutely gorgeous. As for the play, I cannot stress enough how much we enjoyed it. The music, the acting, the sets, all of it did justice to the genius of Carole King. We loved every bit of it and it was really hard not to sing out loud along with the actors, because we knew all of the words! If Parker was here, she would probably point out that she did not believe a word of that, because I have never gotten the words to songs right, but that is my story and I'm sticking to it. I knew those words! We made our way back to the hotel, this time walking to the beat of so many Carole King songs, songs we never even knew she wrote. We knew we had a long drive back, but we were determined to squeeze as much as we could out of the time we had left. The next morning we got up, packed the car and took a long drive out of the city so that we could get one last look at the beautiful architecture that is so uniquely New Orleans. We had one last meal to squeeze in, too, and we could not resist going back to The Blue Crab one more time. It was that good. In a city of a million wonderful restaurants, we went right back to the first one we discovered. This time Luanne and I shared some more of those amazing chargrilled oysters and an order of barbecued shrimp. Merri and Julie shared the barbecued shrimp and added a bowl of crab and corn bisque. I'm still dreaming about those oysters. On the way out of the city, we stopped at a nearby grocery store for some French bread to bring home. I was totally blown away by two huge boats filled with boiled crawfish and steamed shrimp just inside the store. I would love to be able to shop at this grocery store on a regular basis! That's it! The end of a wonderful trip with wonderful friends. I can't wait for our next adventure! Three Friends and a Fork along with our great friends, Julie and Merri, give Weidmann's, The Blue Crab, Cochon's, Monty's on the Square, Mr. B's Bistro, the city of New Orleans and Beautiful at the Saenger Theater 3 Beeyouteeful Yums UP!